1. 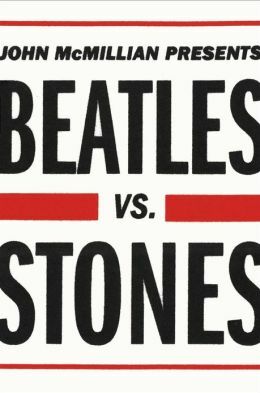 In Beatles vs. Stones you talk about how the two bands were in fact fans and supportive of each other, albeit competitive and cruel at times. Journalists and fans, on the other hand, often defined the Beatles and the Stones in opposition to each other. What do you think this crafted divide reveals about a generation’s self-perception? First, Martabel — thanks for your interest! It’s nice to be in touch with you, in this fashion, after not seeing you for a few years. Congrats on all the great work you’re doing. The book begins with an epigraph from F. Scott Fitzgerald; it’s the line where he says that the test of a first-rate intelligence is the ability to hold two opposing ideas in one’s mind at the same time. And I’m trying to suggest that the Beatles and the Stones were both friends and rivals. They struck up a friendly rapport, and they bonded over their shared experiences. At the same time, they were constantly competing for record sales, cultural influence, and aesthetic credibility. And as most people understand, emulous competition rarely nourishes a friendship; more often it breeds anxiety, suspicion and envy. But yes, even as the Beatles and the Rolling Stones tried to play down the idea that they were “rivals,” journalist and fans often dwelled upon their opposing qualities. I can’t really blame them; however much the two groups had in common, their differences make comparison irresistible. Especially early on, more rebellious and disaffected teens tended to become Stones fans. By contrast, the Beatles were much more acceptable and especially in England in the early 60s, they were popular at all levels of society. Parents, teachers, politicians, and even the British royal family liked the Beatles. Whereas hardly any adults could tolerate the Rolling Stones. I don’t think a lot of people nowadays are aware of just disreputable the Stones used to be. 2. One thread in the book that is particularly interesting is your discussion of how the two bands perform social class. The Stones disavowed their privilege and The Beatles initially performed squeaky clean (after their time in Germany) to gain mainstream acceptance. What insight do you think this phenomenon reveals about the changes in class dynamics post WWII in the UK and US ? What the Stones did was very unusual. British society after World War Two was a lot more rigidly segmented and class conscious than it is even now. For the most part, young men tended to march lockstep into the same types of careers as their fathers. But Mick Jagger and Brian Jones both turned their backs on their opportunities to become stereotypically successful. Brian came from an upper-middleclass home, and he could have gone to on to a very good university, but of course he was much more obsessed with getting a blues band going. And Mick briefly attended the prestigious London School of Economics (this at a time when only about 2 percent of English school kids went on to college). And of course the Stones were from London, the capital city. By contrast, the Beatles came from Liverpool, in Northern England. Differences between the two regions were stark. People from London really tended to look down on the North (a bit like someone from New York City, or Cambridge, Mass, nowadays, might look down at someone from the rural South). And so I think a lot of people in England were surprised when Beatles hit it big; there was a widespread sense that Northern England was a culturally barren wasteland, and yet somehow the Beatles emerged from there. There seemed to be something discrepant about that. Meanwhile, the Beatles and the Stones were both a little bit intimidated by America. (In my book I call them “Yankophiles.”) The dazzling array of consumer goods and leisure opportunities that American teenagers took for granted were completely foreign to most youths who came of age in England after the War. 3. You argue that the bands weren’t actually that invested in politics during the 60s, although their images were mobilized to political ends. Can you comment on this in relation to another great debate of the generation who came of age during this time: hippies vs. politicos? Well in the mid ’60s the Beatles started smoking pot and taking acid, and they plainly affiliated with the gentle radicalism of the hippies. John Lennon was the smartest Beatles, but he wasn’t too well educated and he was very impressionable. And at first, he got very caught up in the aesthetic radicalism of the counterculture. He was a big champion of flower power, love, peace and so on. But by the late ’60s, a lot of politically minded youths had developed a critique of the counterculture; they thought it was frivolous. And so they championed radical political organizing, and (often times) a politics of confrontation. In 1968, the Beatles released Lennon’s song “Revolution,” which celebrated the cosmology of the hippies, and really put down the New Left. A lot of political youths were, for the first time, incensed by the Beatles. They felt betrayed. Then the Stones came along with “Street Fighting Man,” which of course seemed to endorse the New Left’s approach. So there was a lot of discussion that summer over which band had the “correct” political analysis. In hindsight it all seems a bit silly, because in fact neither band was ever really developed a sustained political viewpoint. But many young people took the debate very seriously back then. 4. What do you think we can glean from this debate about the sexual revolution and changing gender norms? Sexual mores were fast changing in both England and America by the time the Beatles and the Stones came along in the early 1960s. But the two groups presented themselves so differently. The Beatles exuded a great deal of sexual charisma, but it was a charisma that was tamed and domesticated. They presented themselves as sweet and vulnerable, and in their songs they had a habit of seeming to tenderly address their young female fans (often through the use of personal pronouns in their songs). The Stones, of course, were always a lot racier. And both groups had their constituencies. It’s remarkable how quickly youthful sexual attitudes seemed to change in the ’60s, and I think both groups were harbingers of those changes. 5. I know you aren’t going to publicly choose a side, so let me ask you this: favorite member of each band? 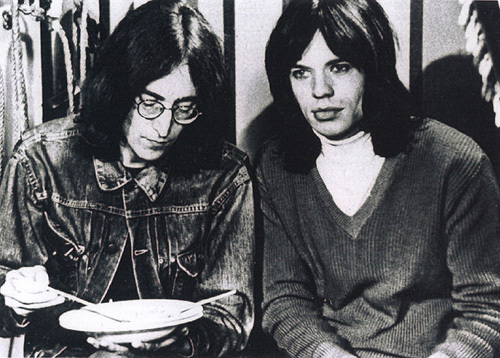 John Lennon and Mick Jagger. John was the smartest and most complicated Beatle, and looking back, we see that his life had some of the qualities of a Russian novel: He was haunted by primal forces of abandonment and loss, and then finally struck down in a hail of assassin’s bullets. And Mick is the smartest and most complicated of the Stones. A lot of Stones fans these days are smitten with Keith Richards (and I like Keith too), but as a result of everyone’s infatuation with Keith, Mick’s talents are too oftenoverlooked. Marc Spitz’s short biography, Jagger — which came out a couple of years ago — makes a very good case for his artistic significance. I wouldn’t say that I have a lot of admiration for Lennon or Jagger’s personal qualities, but but they were both so charismatic, talented and enigmatic. It’s fun to try to figure out what made them tick. John McMillian is an assistant professor of history at Georgia State University and the author of Beatles Vs. Stones, which will be published by Simon & Schuster on October 29.